After buying a car so she could learn to drive a 22-year-old woman drove dangerously and now has been banned from the roads for two years. Torie McAlinden, Hill Street, Lurgan, admitted a series of offences last Wednesday at Craigavon Magistrates Court. For dangerous driving on April 18 this year she was fined £200 while she was also fined £200 for not having insurance and £25 for not having a licence. On each offence a concurrent two year driving ban was imposed. She was fined £25 for permitting a man to drive without a licence on April 20 and £25 for permitting him to drive without insurance. McAlinden was also fined £100 for not having insurance and £25 for not having a licence. Again two year concurrent bans were imposed on each offence. 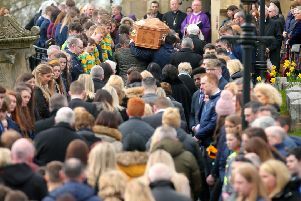 The court heard that on April 18 the injured party was stopped in the Mark Street area in Lurgan where she had been collecting her child from school. A car came along and nearly collided with a parked car. It then zigzagged across the street, narrowly missing another parked vehicle. The driver seemed to be talking to a passenger before accelerating into the injured party’s vehicle. McAlinden exchanged details with the injured party and said she was just learning to drive. She drove off but stalled her car and other vehicles had to drive around her. On April 20 police stopped a car at Kitchen Hill in Lurgan and the defendant was a front seat passenger. She said that the car belonged to her and she had been driving it earlier in the evening. When interviewed she admitted the collision but denied zigzagging and said she was going to get insurance the next time she received her benefits. A solicitor representing McAlinden said she purchased the vehicle with the intention of learning to drive. Her client would say she had only driven a short distance.